Do you have something to confess? This month’s writing challenge lends itself to writing about secrets, sins, forgiveness, or perhaps something more. Each month, The Poisoned Martini presents a photo to spark your creativity. Such images, because of their visual nature, vividly speak to writers and spark ideas for writing. View the image below and write a scene, a short story, a chapter, a novella, or maybe even a novel. Consider what the image means to you, what it reminds you of, or explore what it could be. Who might be the viewpoint character? What is or isn’t happening in the scene? Ponder what you see and then put pen to paper or finger to keyboard. Last month’s writing challenge featured a window display of a shop in Strasbourg, France. Prominently featuring stamps, the shop catered to philatelists’ needs. The photo was taken in August 2014. View the image here. 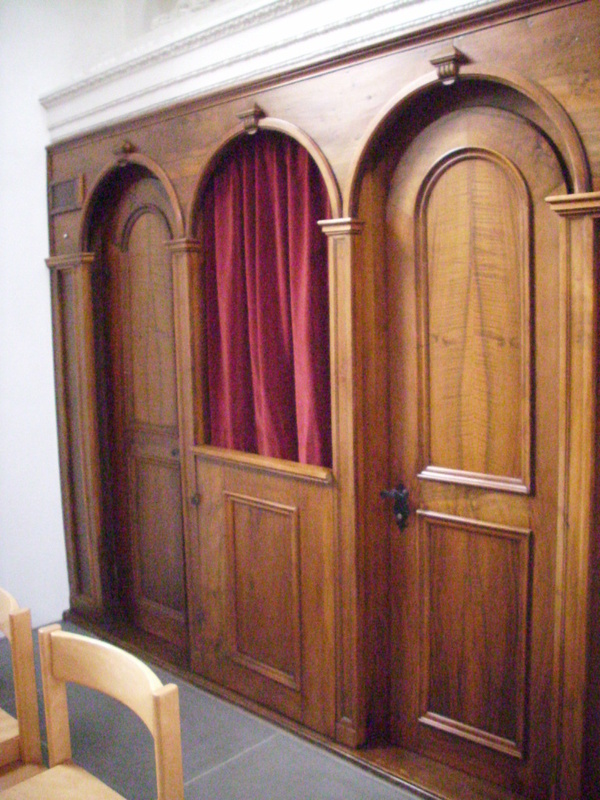 As for this month … confessionals have many different designs, but their purpose is generally the same. What story might this image suggest or inspire you to write?